Tonight in Manchester is the second night of the tour, and there is a massive buzz around the Ritz as fans gather to kick off the night early with Beartooth taking the stage, who pull a pretty impressive crowd for the first band of the night. The set list is built up heavily of the 2013’s E.P Sick, as there is little material to build up much of a set. But non-the less they get the crowd going and the show is well under way. Issues are up next and they know what to expect having followed Of Mice & Men around North America. The Atlanta sextets have built up a fan base quickly in the UK and many of them are hear tonight to see them. As the lights drop deafening screams fill the room and from this moment you know to expect something special. The metal core band takes the stage to the opening riffs of ‘Stingray Affliction’ with vocalist Michael Bohn screaming, “Show me what you’re worth!” To no surprise the crowd prove they are here and ready with the room bouncing from the beginning. 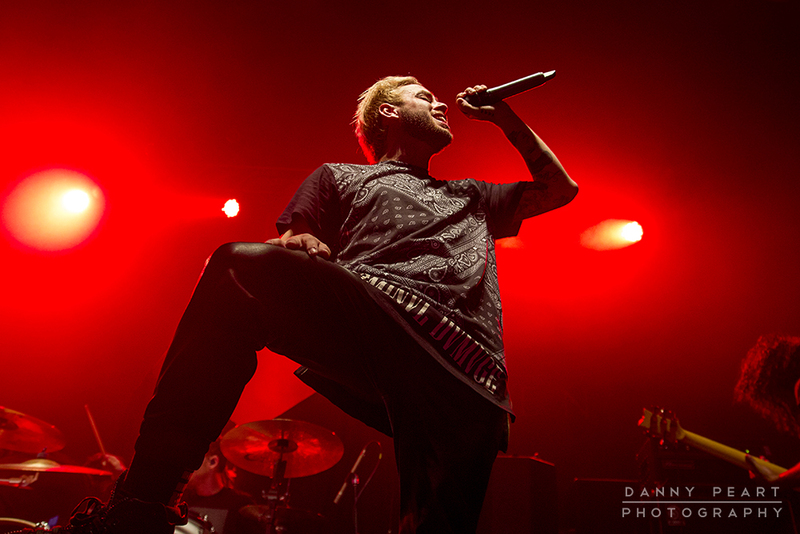 Issues look energetic and confident, filling the stage and getting the crowd involved throughout the set. ‘Princeton Ave’ provides a call for mosh pits and circle pits, but ‘King of Amarillo’ sparks a big reaction from the increasingly growing crowd, as the floor feels like its about to give way whilst the room starts bouncing in force. The metal core band strike a similarity in sound with the likes of Yashin and the early Linkin Park, and ‘The Settlement’ is a prime example of this with the mixing of decks with heavy guitar riffs, aside the back and forth vocals between the two front men. Tyler Carter takes a moment before ‘The Settlement’ to thank the crowd for the Gummie bears hurled onto the stage as Tyler Acord calls the ten-second rule whilst helping himself to a mid set snack. “Have we got any hooligans?” calls out Michael Bohn with a grin from cheek to cheek. The crowd goes mental for the closing song ‘Hooligans’ which provides the highlight of the night with the biggest crowd reaction so far with crowd surfers and mosh pits opening up across the floor. Its more then an impressive performance particularly for a support band, and you can guarantee we will see a lot more of Issues to come in the UK this year. Of Mice & Men are tonight’s headliners and show what they have picked up from touring with the likes of Bring Me The Horizon earlier this year. Opener ‘Public Service Announcement’ gets the show started and provides the middle finger towards the press for the recent negativity towards the band. The room turns into a warzone with crowd surfers, mosh pits and circle pits, as the band tear up the stage for the 13 strong set list, including the likes of the crowd favorites ‘The Flood’ and ‘Second & Sebring’ in which front man Austin Carlile growls and screams his way through from start to finish. ‘OG Loko’ splits the crowd for a lethal wall of death, and songs such as ‘Bones Exposed,’ ‘Feels Like Forever’ and ‘Would You Still Be There’ go down a treat from the new album ‘Restoring Force.’ The highlight of the night comes in The breakdown of ‘The Depths’ which provides a moment for the front man to get the crowd crouched low, ready for a Mexican wave style bounce from wall to wall as it kicks in with a full room mosh pit. Soon after the California band leave the stage the crowd starts stomping on the floor to fill the room with a thunderous noise for an encore, which soon provides the new single ‘Your Not Alone’ to end the show on a high.